Smartphone repair cost aren’t always pocket friendly, especially if you want to fix something of a Flagship device. But, does that mean the service cost would be more than the price of the actual smartphone? We are aware of bad service experiences with companies, this one is quite unusual. 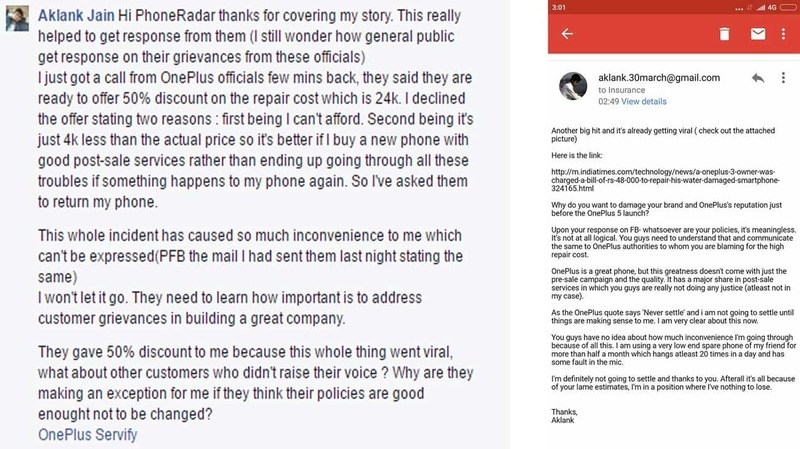 OnePlus 3 owner Aklank Jain recently posted a complaint on Facebook, grumbling about the horrible experience he had recently, trying to repair his phone. Aklank was asked about 1.5x the actual price of the device, for the repair of his water damaged smartphone. 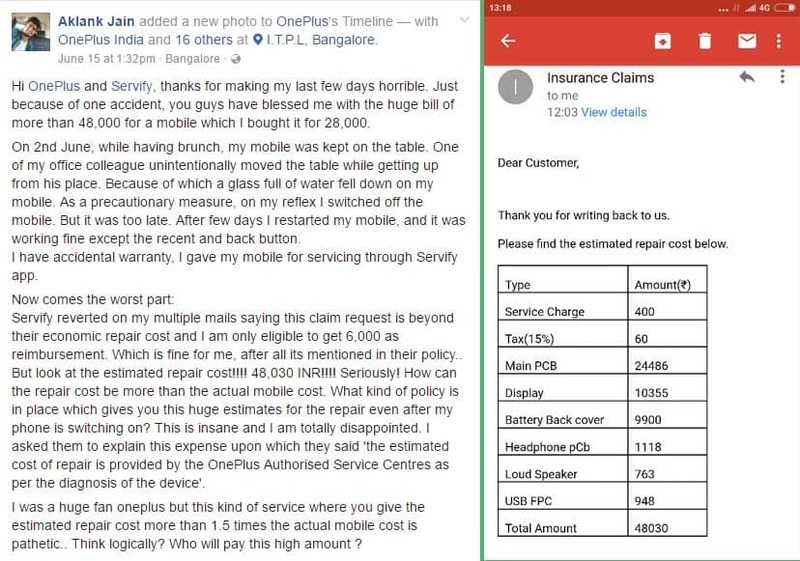 Phone Radar first spotted the issue, where Jain tagged both OnePlus and Servify, an online service that lets OnePlus device owners to connect with authorised service centres and provides insurance. Servify reverted back to him stating that the claim request is beyond their economic repair cost. He was eligible to get only 6,000 INR as reimbursement as per their policy. Perfectly understandable, considering that’s what the service stated in its terms and conditions. However, to his shock, the estimated cost of repairs predicted by the service center was a whopping Rs 48,030! Hi PhoneRadar, Thanks for covering my story. This really helped to get a response from them (I still wonder how general public gets response on their grievances from these officials). I just got a call from OnePlus officials few mins back, they said they are ready to offer 50% discount on the repair cost which is 24k. I declined the offer stating two reasons: first being I can’t afford. Second being it’s just 4k less than the actual price so it’s better if I buy a new phone with good post-sale services rather than ending up going through all these troubles if something happens to my phone again. So I’ve asked them to return my phone. This whole incident has caused so much inconvenience to me which can’t be expressed (PFB the mail I had sent them last night stating the same) I won’t let it go. They need to learn how important is to address customer grievances in building a great company. They gave 50% discount to me because this whole thing went viral, what about other customers who didn’t raise their voice? Why are they making an exception for me if they think their policies are good enough not to be changed? The accessories and spare parts will have taxes and import duties imposed on them individually so the repair cost will be higher. However, as an exception, we have contacted the customer and asked him to pay 50% of the repair cost excluding the reimbursement of Rs 6000 which is being given by the Servify team to replace the product. The customer is not agreeing to our terms but we are still in touch with the customer and if he shares any positive response then definitely we are looking forward to getting this fixed. We appreciate your support in this matter. We really appreciate the efforts of PhoneRadar in covering up the entire matter and reaching out to OnePlus. Even after everything, this case might have affected the Chinese Manufacturer’s brand image just before the launch of their new flagship, OnePlus 5. What do you think? Will you buy a OnePlus 5 after this case? Why it's bad to be a mobile filmmaker and an Android user at the same time! Nokia replaces the Withings brand; new Nokia branded digital health products launched.